I would like to thank CaseLabs for supplying the review samples. 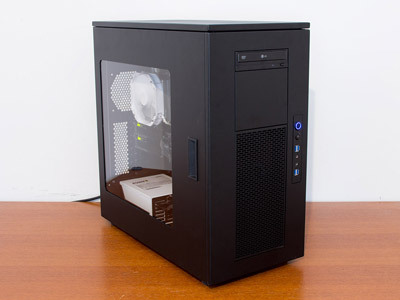 Several companies out there offer cube cases that are all to some degree customizable. CaseLabs is such a new brand. Combining utmost quality with a new level of modular design not seen in other cube cases, the people behind CaseLabs actually decided to join the consumer market in 2010 by using their expertise to produce these cases after having produced enclosures for electronic-, military-, medical-, and industrial applications since 1971. The company has steadily been adding to their range of cases since 2010, and the Merlin family includes full tower cases with the ability to hold not only the latest and greatest in hardware, but also an incredible amount of water-cooling gear. We now have the pleasure to take a look at the Merlin SM8. Much more compact than the Magnum M8, it is still as customizable as all the other case options from CaseLabs. The chassis is available in black matte, white matte, and gray primer. The latter is not meant to be a cosmetic finish but a base for your own paint job. Motherboard door: solid, ventilated, std. window: 10.75" x 10.75" (273mm x 273mm); clear or gray. Due to the modular nature of the chassis, the above are the specifications without any additional parts or customizations.